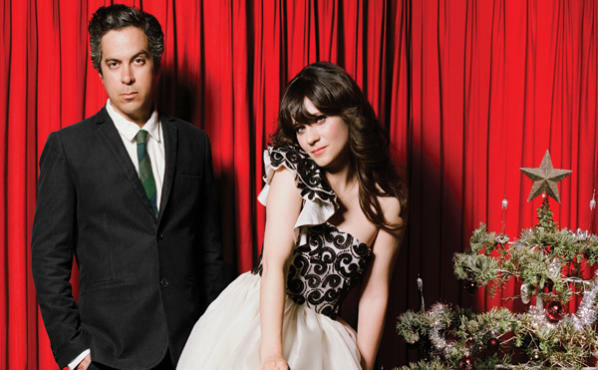 Zooey Deschanel and M. Ward embrace the holiday spirit on a new Christmas album. After releasing two albums of original songs, the star of Fox's hit sitcom New Girl and the acclaimed singer-songwriter--producer present A Very She & Him Christmas, a stocking stuffer of delicate, intimate covers from the holiday canon. The duo spoke to us from L.A. about seasonal traditions, curing cynicism and attempting to cover Mariah Carey. What made you decide to put out a Christmas album? Him: We had been talking about making one since Day One. We have an affinity for old songs and melodies; it was a natural extension of our interests. She: One thing I love about Christmas music is that it has a tradition of warmth. Him: The sign of a great Christmas record is when you put it on in December and it's like the first time you've heard the songs. What do you think makes a good Christmas song? Him: It's about joy and peace. They're not made for the cynical listener. I've learned from doing press for this record how cynical people are toward this holiday. But music is a great place to start to cure cynicism. We all feel that way sometimes, especially when commercialism has turned holidays and holiday music into a way to entice you to spend money. I feel like cynics may be confused by your album. They might not want to like a Christmas record, but yours never comes off as schmaltzy. Him: Yeah, I agree. I think if there is some jolliness to be found, we are not there to beat you over the head with it. How did you go about selecting the songs? Him: We had a list of a couple dozen of our favorites. When we got to the studio, we started experimenting, seeing which songs we were able to breathe new life into. She: We recorded so much stuff. We did Mariah Carey's "All I Want for Christmas Is You," but it just didn't quite come together. We didn't rehearse a lot. It was just: How about this one? We'd work through it and try to figure out a good arrangement. It grew very organically. One of the reasons why I love working with Matt is that we both like to work improvisationally. When we're playing shows we'll sometimes throw in covers that we literally just decided [on] an hour before the show. There's something scary—but fun—about that. When did you record it? She: You have to turn in a Christmas record in June. We had a week in April. We literally tracked it in six days, mixed it in three and then mastered it in one. It took ten days total to make. I really liked the spontaneity of that. Him: Zooey brought "The Christmas Waltz" in. I had never even heard that song and it's now probably one of my all-time favorite Christmas songs. I wanted to try "Baby, It's Cold Outside," and Zooey suggested switching the [gender] roles. She: I love that song, but I did it in Elf. I had seen an old movie [Neptune's Daughter] that had switched the genders. I thought it could be a fun way to make it different. It feels less creepy when it's the girl trying to keep the guy there. It takes on a new complexity. Did you have a set concept for the way you wanted the album to sound? Him: We knew we wanted to go against the normal approach to Christmas songs, which is overproduction. With so many Christmas songs, it's very clear that it went through many people's hands, whether or not they were musicians, before it got to your ears. And if you can cut away as many middlemen as possible between someone's voice or the sound that's coming out of a guitar and the listener's ear, that means that you're onto something good and you have the opportunity to really say something. We felt that if we stripped these songs to the bare essentials, something new would come to life. What did you gain from this approach? Him: It brings out the lyrics rather than this 12-piece bell choir or army of piccolos. There's sort of a direct line between the listener and whatever inspired the songwriter, this connection that's really hard to put your finger on. Listening to the album, you can hear things like Zooey's breaths between lines, or a very faint smacking of the lips—it made it feel very intimate. Him: [This] record was produced the same way that I produce all my records: We recorded to analog tape instead of digital file. That's what gives the music more breathing room. When there are breaths, or when there are little nuances like that, digital technology won't even pick that up because the digital process is a filtration process. Either that, or a lot of engineers will just highlight it and delete it for the sake of volume and what's called compression. Zooey, is having your voice at the forefront liberating or terrifying? She: That's what you want. My kind of singing works best that way. Modern recording has made it so that people can spend forever taking shortcuts and making everything uniform, but that strips music of what makes it exciting.